Next Friday, we’ll see you (those of you who are lucky enough to be going) at Edinburgh Yarn Festival! This is our last post and last Prize Giveaway to celebrate the road to Edinburgh! 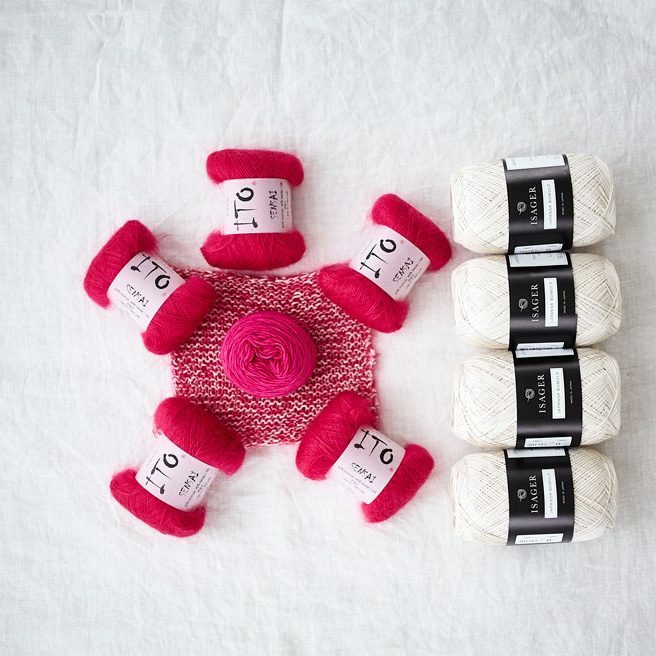 We’re launching a few kits at EYF and this week we’d like to introduce you to Blink, our Isager Japansk Cotton Tape and Ito Sensai Mohair pullover in collaboration with designer Ragnhild Vaaland. Last Autumn one of our lovely regular customers from Norway, Ragnhild Vaaland, came into Loop wearing a beautiful sweater. We loved the slightly cropped and boxy shape and the light textured fabric with the sweet pockets. When Susan asked her what the pattern was, she said that she made it up. Ragnhild had never written a pattern before but with very little persuasion agreed to work with Loop to make it come to life. With the help of Juju Vail and Rachel Atkinson (pattern writing and tech editing), Blink was born! 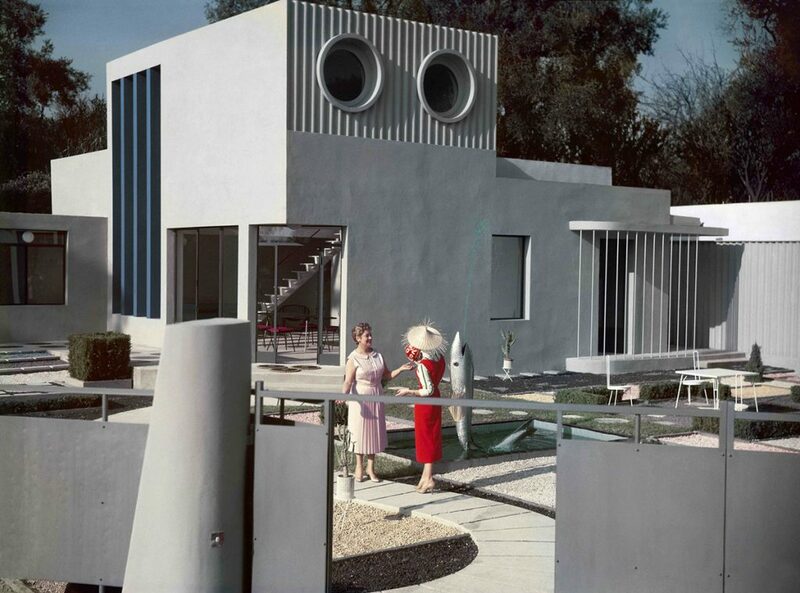 Ragnalhild is a friend of Julie Arkell, who suggested the name “Blink”, when the pockets reminded her of the house in Jacques Tati’s film “Mon Oncle”. At Loop we love a casual knit, that is great for layering. This piece is perfect! It’s oversized enough to fit over most garments, but lightweight; it won’t weigh you down and the plant fibre from the Japansk Cotton means it is a cool and light sweater. 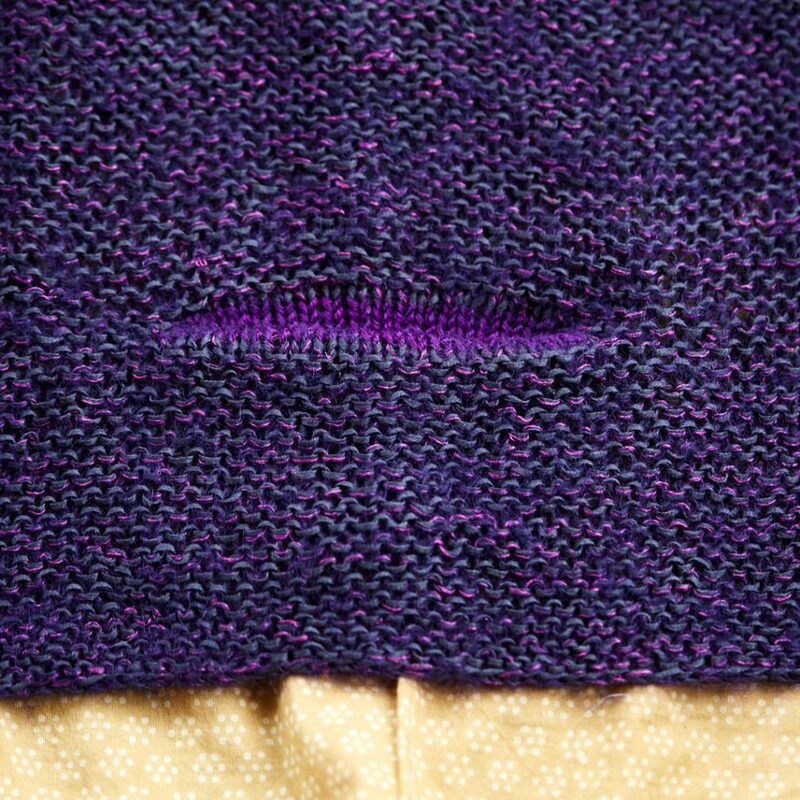 This is also a super easy knit as it is pretty much all garter stitch! The fabric is a beautiful combination of Mohair and Isager Japansk Cotton Tape. 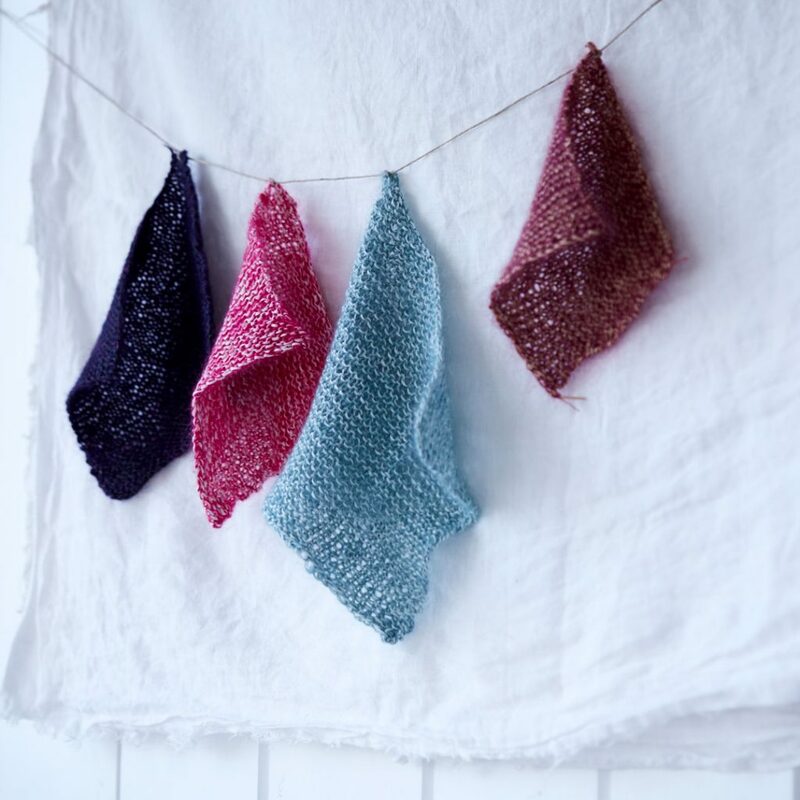 We’ll have four kit versions for you to buy at EYF: Blackberry, Pop Pink, Bordeaux and Duck Egg! The kits include a printed copy of the Blink pattern and enough yarn to make the small/medium or the medium/large version of the sweater and it all comes in a Loop cotton shopper bag. 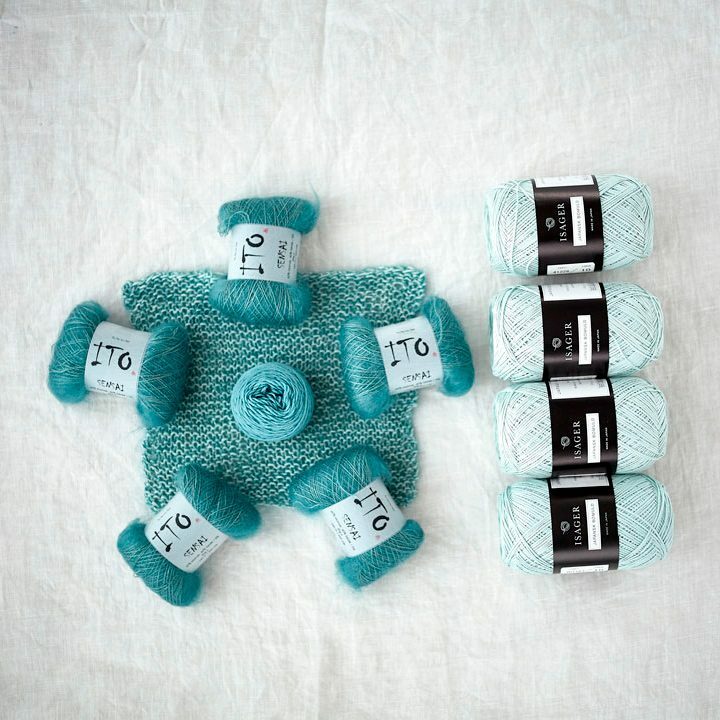 The kit comes with all of the yarn you will need but the provisional cast-on pockets means that you can also have a play deciding on the colour of your own pockets using a little stash yarn to customise the kit if you like. While we have been test knitting the pattern we have seen so many lovely versions that we can’t wait to share with you in a few weeks! 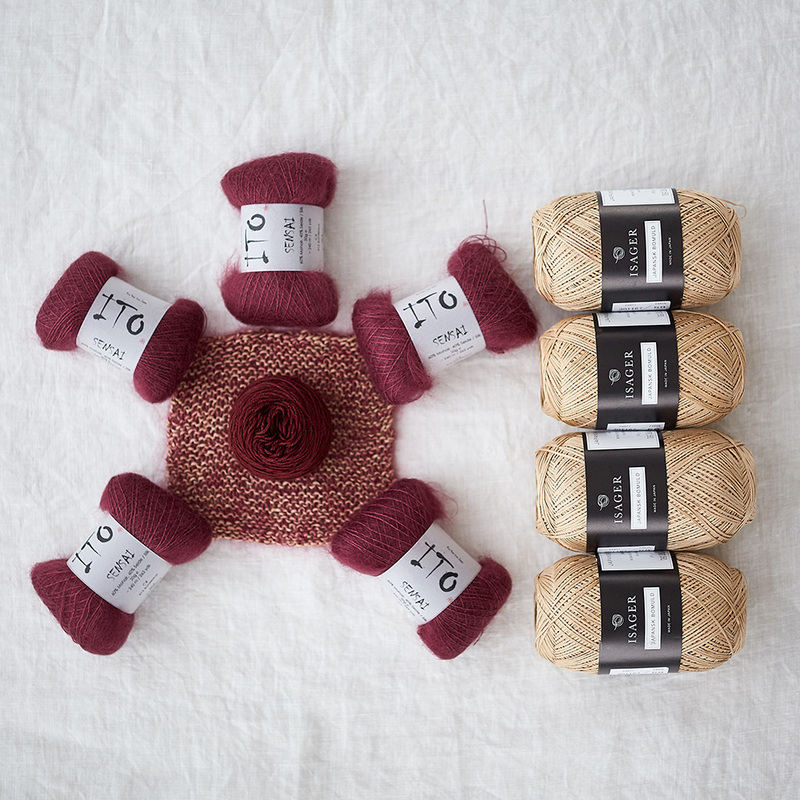 Each kit includes five balls of Ito Sensai Mohair and 4 balls of Isager Japansk Cotton Tape as well as Lang Jawoll yarn to make the matching pocket (seen in the middle of each photo above), the pattern and a bag. These kits are a great savings as the real value of them is over £93 but they will be £84 as a treat to you. These are limited editions – there aren’t tons of them, so try and come to our stand, E5, early if you can. If you are not going to EYF, no worries- we’ll be launching both the single pattern as well as a lot more beautiful Blink kits in just a few weeks! Blink will be available as an individual pattern after EYF! Stay tuned for more details about that later in March. Thank you to Ragnhild and to all of the test knitters!!! We’re so excited about this beautiful knit and can’t want to start seeing all of your blinks!!! Ragnhild Vaaland in Blink. Holding Pop Pink kit version. Prize Winner and New Prize Draw! This week is our last prize giveaway on the road to Edinburgh Yarn Festival! We’ve had a great time offering prizes for those who don’t have the chance to see us at EYF! Thanks for being involved! Last week we offered a kit, in the colour of your choice, of our new free patten: Tiny Tassels! Tiny tassels and its kits have been hugely popular. Thanks for making them such a success. We’ll have more kits available online after EYF. The lucky winner of the kit is Susan, who commented on the blog. Congratulations! We’ll be in touch to get your address and colour choice. Leave a comment here, on our blog. One winner is drawn from the total combined entries. Good luck! And we hope to see you at EYF! Love it and hope to win it :-) Happy travels to EYF!! I would wear this!. So cute! Lovely Jumper and perfect for us ‘newbie knitters’. Thank you for making EYF such a great experience! Love the simplicity of this garment, can’t wait to make it. Lovely sweater and in yarnsI love to work with. Praying that I will be lucky this time! SCRUMPTIOUS!!!! Love this soooooo much!! This one is a MUST knit! This is a gorgeous sweater, the blueberry colour is die for! It s so pretty ! So beautiful and ever somwearable over all my dresses.. love the Bordeaux set. How wonderful pure simplicity and gorgeous who wouldn’t want to make and wear that! How wonderful pure simplicity who wouldn’t want to make and wear that! I‘m looking forward to meeting you at EYF. This looks lovely. It will be my first garment when the kits are available. What a gorgeous set of kits you have prepared for this wonderful pattern … I believe that Duck Egg is my favorite, but Blackberry is not far behind! Please enter me in the giveaway. Thank you! What a Lovely casual and elegant look. I Would really love to do the bordeaux blink. Simple, elegant but probably quite warm. Duck egg is my favourite, but that purple is lovely as well. Think of the fun finding a little something to line the pockets with.. koigu KPPPM perhaps? Have to love that jumper, it’s so me! I love the boxy look to this jumper, it’s now definitely on my 2018 knit list! But now I’ve seen the colourways I might have to make 2! Pink pop and Bordeaux! Beautiful and so versatile, blackberry would be my choice! Lovely jumper and beautiful yarns, love the blackberry! Love, love, love, especially the Bordeaux! That looks like the ideal jumper – simple and stylish. Great colour choices too. Cannot make it to Edinburgh, but would love a chance to knit Blink in Blackberry. Love the colours and textures of the yarn. I love the Pink Pop Blink Kit. That is my favorite. I thank you for the opportunity to enter. Oh wow! Stunning pattern and that duck egg blue kit is absolutely beautiful!! Fingers crossed! Very interesting combination of yarns. I can’t wait to see the finished jumper at EYF. Blink looks wonderful – both in design and the yarns. How perfect!!!! The color choices! So challenging to choose! Nice! Absolutely love it, would love to win one! What a lovely sweater. I could manage that! Plus beautiful yarns. Fabulous. Wow, I love the Blackberry option. Very lovely. Simple, classic, sophisticated yet also fun – a perfect garment! My choice would be Duck Egg but all the colours look wonderful. 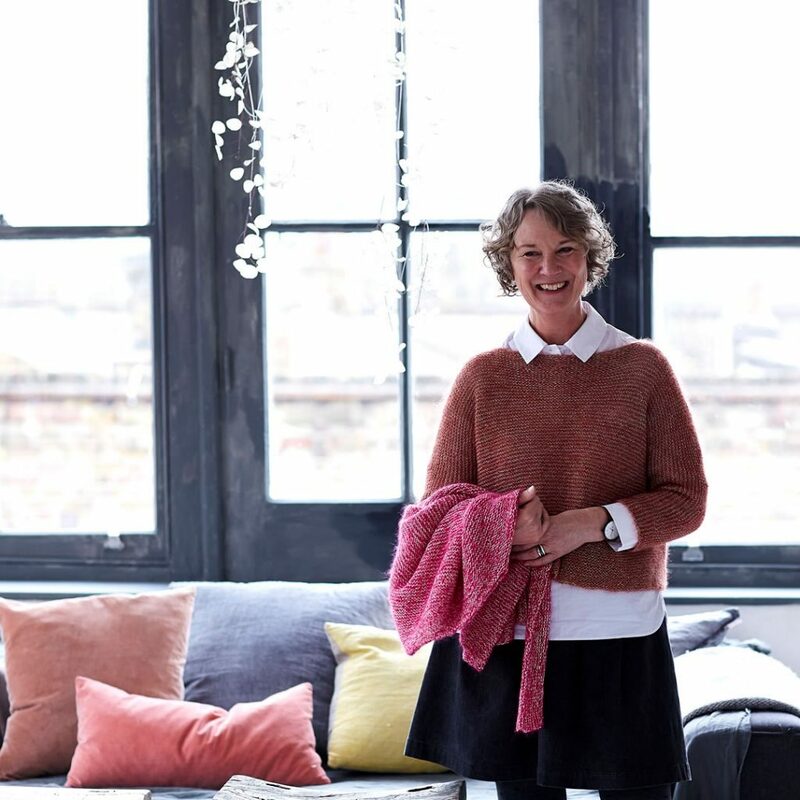 so excited to have a chance to win, I love the pink, team it with crisp white cotton and denim, perfect…well done Loop and Ragnhild. What a generous give away and a beautiful kit as always by Loop! See you at EYF! Such a gorgeous kit and design! Thanks for the giveaway! What a lovely sweater! So simple yet stylish! I love it! Blink is an absolute winner, which works in all these colours. Beautiful pullover. I will so enjoy making and wearing this design. Thank you for the opportunity to win a kit. Such lovely colour combinations. I would just love to be one of the lucky winners. Love this pattern. I would love to try Liberty print pockets! Gorgeous design. Love all the colours, though I think the Bordeaux would be my first choice. I love it! A simple, timeless passe-partout top in duck egg color. Well I just love that sweater. All of the yarns used are just gorgeous and I have been meaning to try them for ages, Bordeaux is my favourite colourway, can’t wait to give it a go. I love the shape and construction of this- easy is right up my alley. The texture and colorways are delicious! But i can’t be in EYFMay be become a winner??? 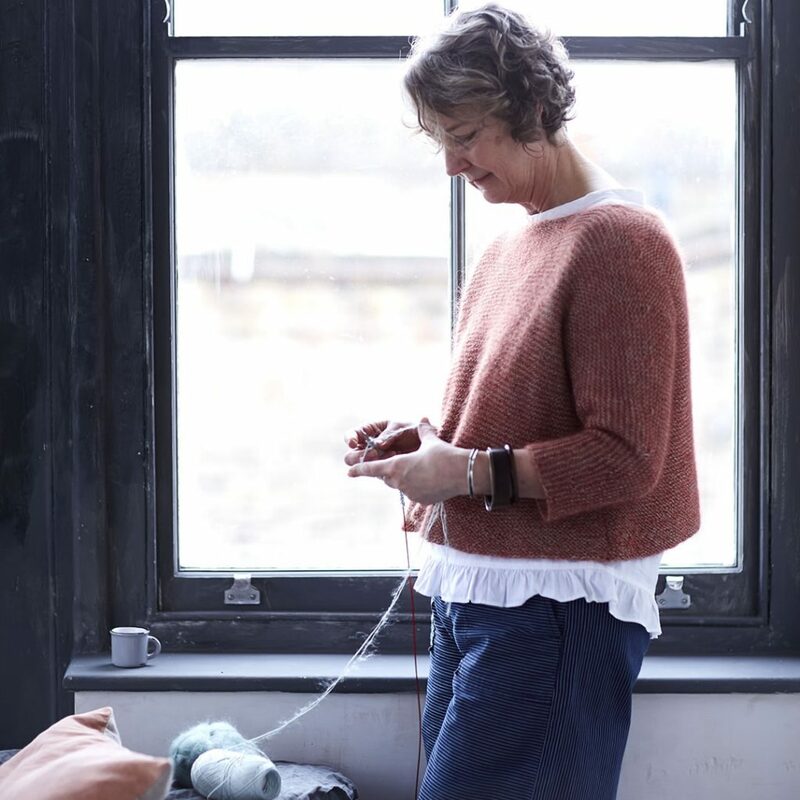 Simple shapes combine so well, I love this garment – love all combinations, but I can’t get away from love of duck-egg blue!! Fun and casual as well as being the epitome of elegance . .I just love the Duck Egg combination.Come and live in our street Ragnhild. Love love it, so easy to wear over summer things and always need a new project to do. Just won’t be able to decide on the colour, I know the lovely staff at loop will help me choose! The perfect Spring layering piece! Blackberry for me. This looks to be a fun knit. 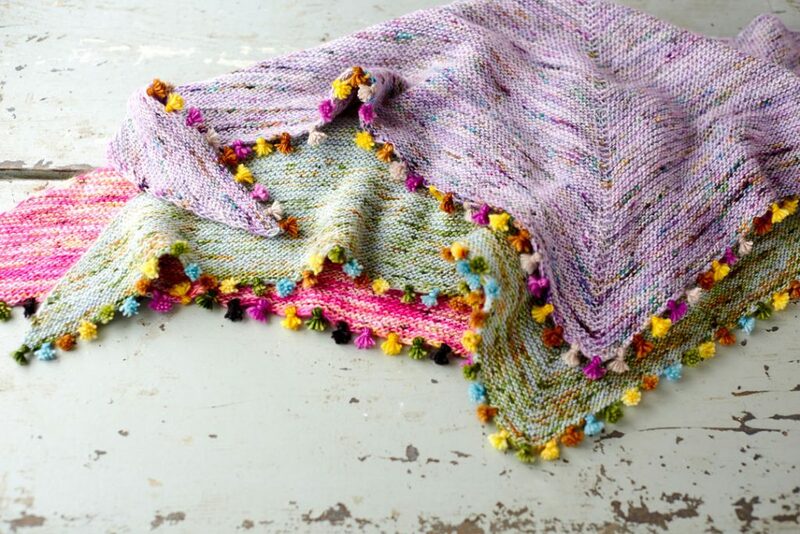 This pattern and yarn is stunning! 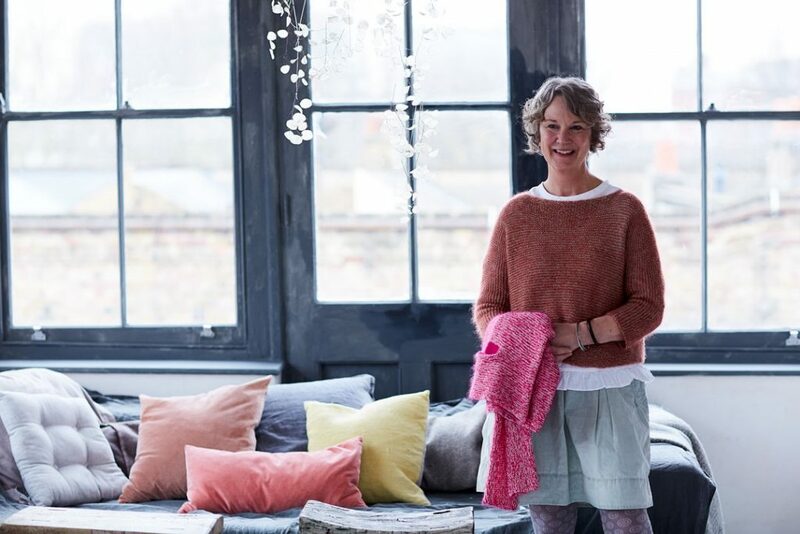 Inspiring to have such a lovely design from a knitter not a designer. We should all do it! In the meantime I’d love a pink kit! Very excited To meet you and Blink in EYF ! Hope to go to EYF one day! Very pretty! I love seeing how different types of yarn combine when knit up together. It looks so cozy and comfy! And sich gorgous colours! How can you choose? What a gorgeous pullover. I love the Bordeaux colourway. My goodness it looks light as air and so very soft my favourite will be blackberry followed very closely by duck egg it is a winner! What a gorgeous pullover. The Bordeaux colourway is my favourite. Looks beautifully tactile and I would LOVE the bordeaux colourway. This is a fascinating use of textures and design. 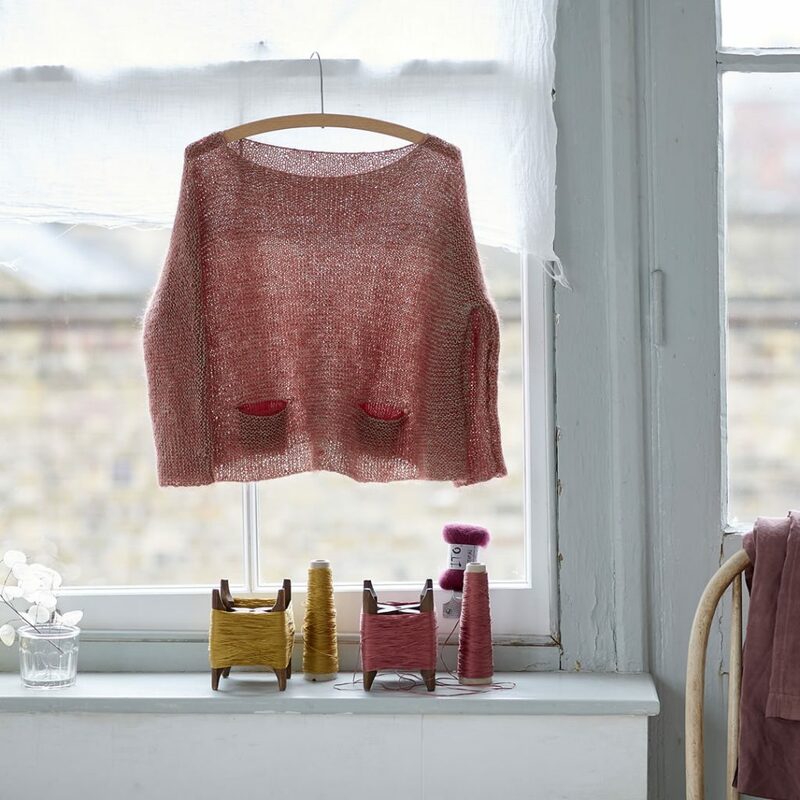 I love the combination of colours shown in this blog and how they can create variations of the same sweater with different brands of yarn too. Love the colours and even though I am a reluctant knitter, I am so slow, this pattern makes me want to pick up a pair of needles and knit again! In duck egg color it must be amazing !! Love this! So perfect for year round! 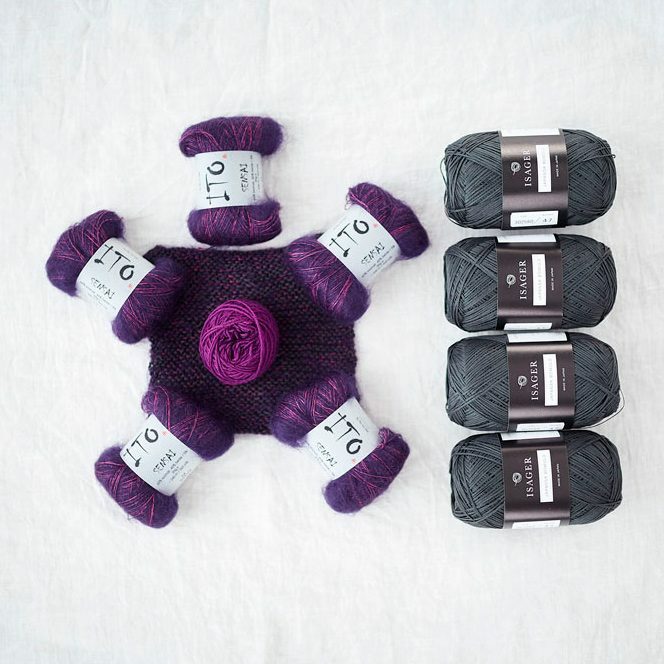 Great simplicity and yarn combination – love the blackberry colours! Wow! Loving this. What a great, wearable piece. Blackberry for me please but I love all the colours so much any would be super. Absolutely love this but unable to come to Edinburgh so I’m hoping to win . Such a beautiful design and every kit colorway just a gorgeous! I too, cannot make EYF this year but what a treat to win this lovely kit. My favourite is duck egg, but they are all gorgeous! Blackberry Blink – love, love, love it. This would a lovely consolation for not being able to go to EYF !!! The pattern is so beautiful! I love the mohair/tape combination! Such a fun knit and a great sweater for the summer. I’d love it. So easy to knit and so wearable, chilly summer days or winter. Those are all great color kits, but I LOVE the Blackberry kit! This is simply the perfect spring top! What a fab pattern! Love the shape and the texture of the two yarns together. Fingers crossed for the giveaway! This sweater is gorgeous! Hoping one day I’ll be be able to visit your shop in person AND attend EYF. This looks like the perfect sweater for Spring! I love the shape and of course, the pockets. This is just my style! I would love one of these kits. Bordeaux or Ducks egg though….aargh! Can’t choose! Love this boxy style and the little pockets! Duck egg color is perfect for this spring sweater! Love. Layering. Love. Light. Love. Shape. Love. Whimsical. What’s not to love? So beautiful and wearable…a true wardrobe basic. Thank you for the great giveaway. Wishing you a great time at the EYF. This is a beautiful sweater which I would love to wear. Thank you for the great giveaway. Sorry for the double reply. Site reply was to repost. Very clever shaping – and what an interesting yarn mix! Really like it! What a lovely shape sweater and beautiful colours! I’ve been looking for a boxy shape sweater like this for ages. Fab concept and design. I love it! It’s so beautiful! All the colours are gorgeous too. Love the style and shape of this so wearable jumper. Blackberry looks super……but all the colours are beautiful. What an amazing giveaway! So simply chic, loving this pattern! Looking forward to the kits being available. Enjoy EYF. What a fantastic jumper to knit and what great yarns with which to knit it! Thank you to Ragnalhild and Loop for your generosity in giving us Blink. Right now I am struggling to choose between one in Blackberry or one in Bordeaux. Fingers crossed for a win!! Fab knit and love the way the colours are combined when knitting. Have never had a go at knitting this way so would love to try it. Have a great EYF – work commitments mean I am unable to attend but will make sure I am not working next year!! The design is beautiful and the colours stunning – fingers crossed! Sometimes the most elegant sweaters are a simple knit – just beautiful ❤️ Love the duck egg blue version Thanks for another lovely giveaway opportunity! Lovely pattern, very wearable. My favourite colour? I love them all, but the Blackberry kit is my most favourite! May we know the dimensions of the finished garment please? For now these are the sizes. More sizes will follow. Remember the sweater is very loose fitting so one size fits many. This is gorgeous – I was born to wear it! Absolutely love it. Simple but beautiful. Amazing, I love the Bordeaux version! I’d love to knit this gorgeous sweater in Blackberry! This is beautiful!!! Thanks for the chance to win!!! Love the sweater – perfect spring transition pattern, and love the colors! Thanks for the opportunity to win a kit! I love this, which colour though!? They’re all so cute. What a beautiful design, elegant but simple, just love it! Simple and beautiful, I love it! Love the mohair combination! Duck egg is great for spring! Cute as a button! love the pockets!!! Simple and so wearable, lovely. All the colors are great but Bordeaux is my pick. I love it! My favourite is bordeaux, very chic! I really need to win this in duck egg. I can’t get to EYF but I would love to make this sweater in the duck egg blue. Love this pattern and the color ways you’re highlighting. BlackBerry is calling me. I will see you next week at EYF! Gosh- what a lovely and airy looking sweater – I love the little pocket details! Gorgeous. I think blackberry would be my choice…. Or perhaps the pop pink. But I really like the Bordeaux. Ok I can’t decide! The perfect sweater. Duck egg is my favorite! love this and cannot wait for the pattern to come out! Adorable sweater! And the Duck Egg is a perfect color! Gorgeous yarns for a beautiful sweater! Such a wonderful garment. So suitable for my lifestyle. Thank you for the prize offer! Lovely. I’m not going to EYE but would love to win in duck egg. Imagine having such an eye for design and not really knowing, glad you asked for it to be written up! That blackberry colourway is gorgeous! Just gorgeous! I’m looking forward to making this one :) Thank you for all the wonderful patterns. i saw the house,I google it online,What a funny movie,the classy ladies and their clothing.Those houses too! I would love to win this BLink,beautiful texture and just loving those pockets.Marvelous design!! The Bordeaux or Blackberry Blink would be an excellent, luxurious, fine and comfortable first try for finally knitting… my first sweater! 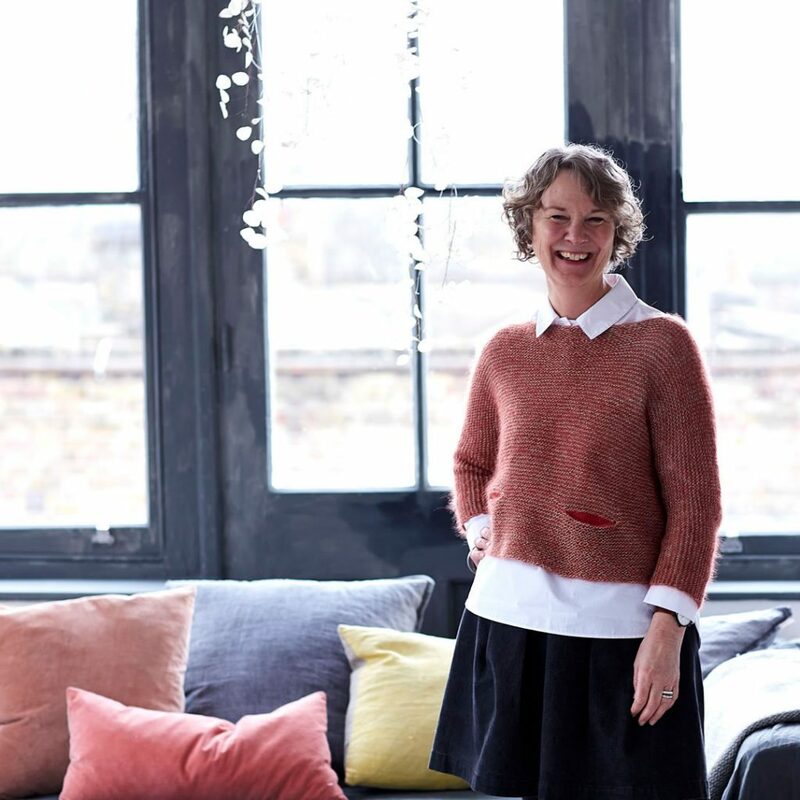 What a wonderfull pattern, and need I say – I do – I love Loop and its always excitingly mindblowing woollen treasure trove! I would love to knit this sweater, the pattern looks so comfortable and neat. Amazing…..will definitely be getting one of these beautiful kits. Hope Edinburgh is fantastic. It has been a while since a have knitted a garment, but this would be ideal and just up my street in terms of the design and look. So pretty! Love the blackberry color! It’s so dark and rich! I wonder if this does a 2XL size. I love the bordeaux, blackberry and oddly for me the blue colours. If it is in my size I see more than one made in my future. What a beautiful sweater and gorgeous colour combinations. Love the Duck Egg blue best. What a great pattern, can’t imagine being clever enough to just make it up! All gorgeous colours but the bordeaux mix is particularly tempting. Blink sieht so herrlich kuschelig und komfortabel aus! At my desk, but dreaming of EYF! Have fallen in love with this beautiful design, and loving the range of colours for the kit!